I'm not sure I can be objective in this review. You see, I seriously seriously "heart" Brad Meltzer and everything he writes or does with History Channel. This book is actually the 3rd in the Culper Ring Series. 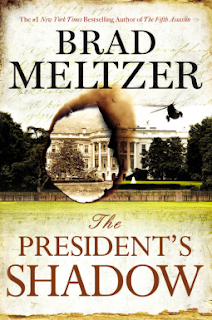 There's a lot of history (George Washington formed the Culper Ring) mixed in to this modern day mystery. The book stands alone, despite being very tied to the series. You don't "hurt" for not having all the details of the back stories, but you'll likely find yourself hunting down books 1 and 2 to get them. Meltzer paints pictures. You can't help but vividly imagine locations and scenes. Character development (which I tend to find tricky for most authors) is really well done. Not only are they described in such a way that you can easily visualize and build in your own mind precisely that person--mannerisms, psychological profiles, even speech patterns. I tend to "hear" voices in my head as I read, and there is a distinct voice for each major player in this story line. In a YA collection, this book might fill a very specific niche (mystery loving future-archivist/librarian sorts) or it might fit a wide-range (mystery lovers, stories with ties to history, people who just enjoy a good story and get invested in characters). It's worth the read, and so are the first 2 books in the series. **This title will be available June 16, 2015. Disclosure of Material Connection: I received this ebook galley from Grand Central Publishing through the netGalley publisher/reader connection program. I was not required to write a positive review. The opinions I have expressed are my own.